Recently, I picked up a copy of this book by Dr. Greger and look forward to his upcoming cookbook following the same principles. The first part of this book is about the research & science behind the health benefits of a whole foods, plant-based diet. The second half delves deep into each food group and offers up what Dr. Greger has dubbed his “Daily Dozen.” There’s even an app for that! There is so much he speaks of that rings true for me and as I began examining my own diet, I realize there are multitudes of ways I can be doing better. To start, my lunch salads were less than nutrient dense. So I decided to up my salad game with this Kale & Quinoa Salad with Lemon Turmeric Tahini Dressing. My goal was to try and pack as much nutrition and variety as I could into my salad. Shredded broccoli stalk, brussels sprouts, kale, red and green cabbage and radicchio make up the greens portion of this meal. To that, I added walnut halves, dried cranberries and even a few pepitas (pumpkin seeds). 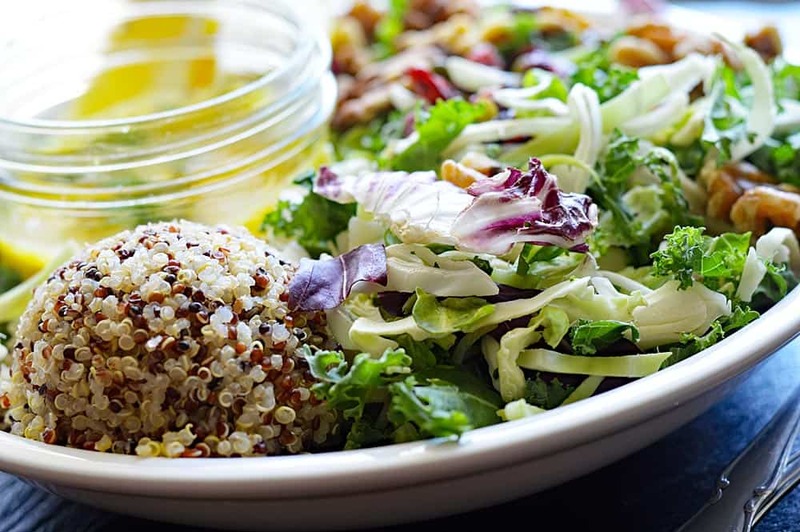 Tri-color quinoa rounds out the salad itself. I also wanted to move away from store-bought dressings and create one that delivered some nutrition. 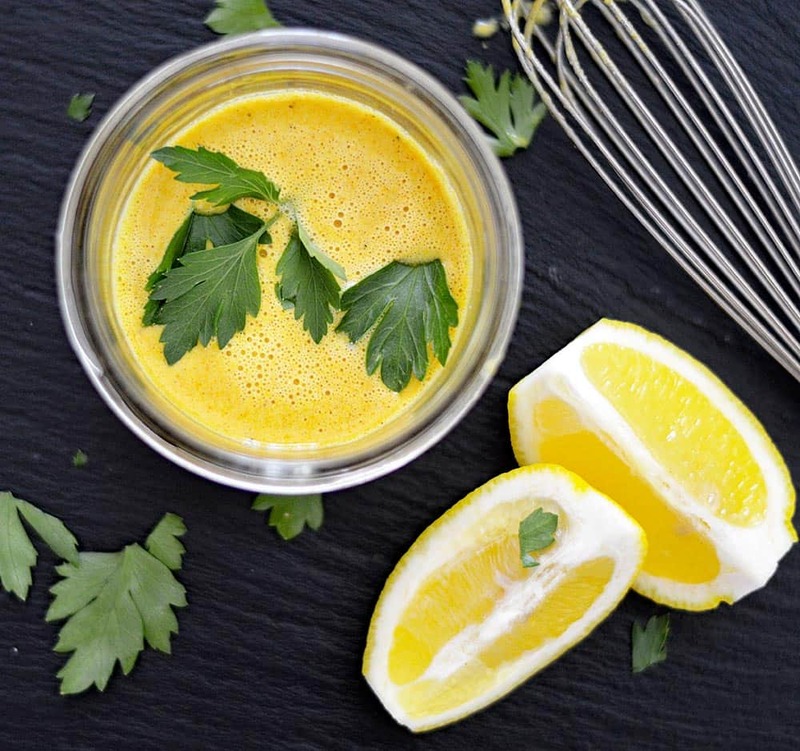 This Lemon Turmeric Tahini Dressing fits the bill! 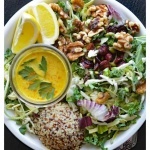 Tahini, turmeric, lemon juice, water to thin, salt and pepper are whisked together to form this creamy dressing. The salad was delicious and it’s way more interesting and colorful than my boring romaine/veggie/avocado salad. I had fun building this healthier salad and so you can expect more coming soon! If you want to know more about Dr. Greger, he has many videos on YouTube. That’s actually how I learned of him and what got me interested in purchasing his book. He also appears in the documentary making waves right now called What the Health. You should watch it! 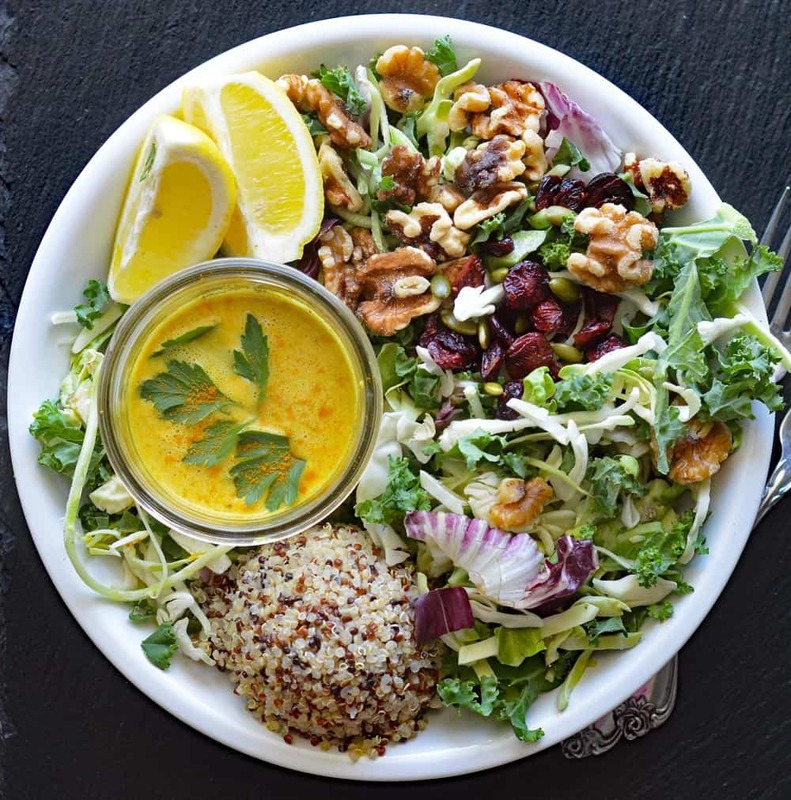 Did you make this recipe for Kale & Quinoa Salad with Lemon Turmeric Tahini Dressing? Let me know in the comments section below. Prepare quinoa to package instructions. I always make more for leftovers. 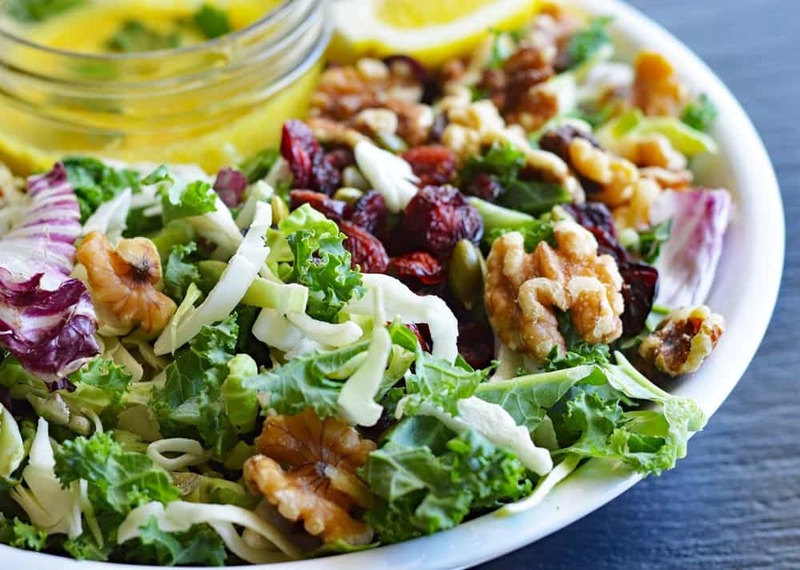 Whisk together all of the ingredients to form a creamy dressing. Chill while you prepare the salad mix. I used a food processor to grate/shred all of my ingredients but pulled the kale leaves off into pieces by hand to maintain some of their integrity. Finish off with the walnuts, pepitas and dried cranberries. Refrigerate leftover dressing for a few days.